Beautiful and Breathtaking – Run. Ride. Roam. Today we saw some scenery that was absolutely breathtaking. Simply stunning in its beauty and grandeur. “Men’s and women’s,” I replied. I looked at him! “You see those two signs out front, one with a picture of a woman and one with a picture of a man? That’s a clue!” I said. So some poor woman could have had an encounter such as mine only this time, it would have been seeing big Steve walking into the ladies’ lav and giving them a surprise! All because the big fella failed to notice the rather clear and obvious and “front and centre” signage! I told him I’d been wondering why the toilets seats kept being left up in the women’s toilet! I thought the women who were camping near us must have preferred squat toilets and so they were leaving the seat up to make things easier! Oh no, it was Steve, using the ladies’ lav and leaving the seat up! That’s a Steve moment! I started the day with a run, only a short 6km today because there were only two showers in the campsite so I didn’t want to dilly dally and thought I’d better be back in good time to nab one. I needn’t have worried and could have kept running because no one seemed to have moved when I returned and I still had the whole bathroom block to myself. The benefits of being an early bird. 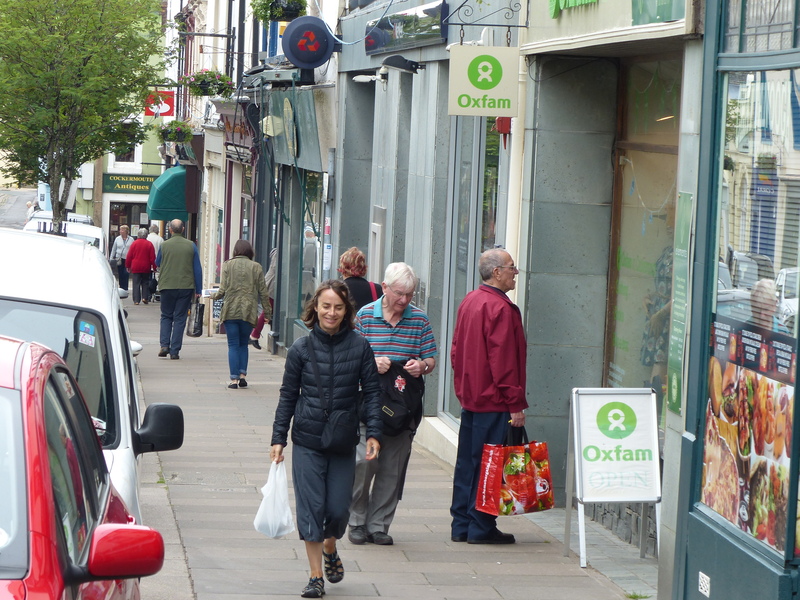 Before we left Carlisle we had some creative financial transactions to take care of. A bit of “money laundering”!! We had a few Scottish bank notes left over and Pauline had told us that in some parts of England, some businesses are a bit iffy about taking Scottish currency, so we thought it might help to get rid of it while we were still close to the Scottish border where it would be less likely to be a problem. So we called into the local supermarket, bought half a dozen items and then went through the self serve checkout and put each item through one at a time and paid for each individually. One red capsicum…57p. Right, I’ll just pay for that with a Scottish £20 and the machine then spat out all my change in British sterling! Next item…strawberries 80p, in goes my Scottish £20 and out tumbled all my English change! We did this one by one with each item and walked out with wallets full of good ol’ English pounds! Sorted! We set off today heading for the Lakes District. We thought while we’ve got the van, we might take the opportunity to see this area and all its hills, with motorised transport rather than having to pedal up all the mountains. 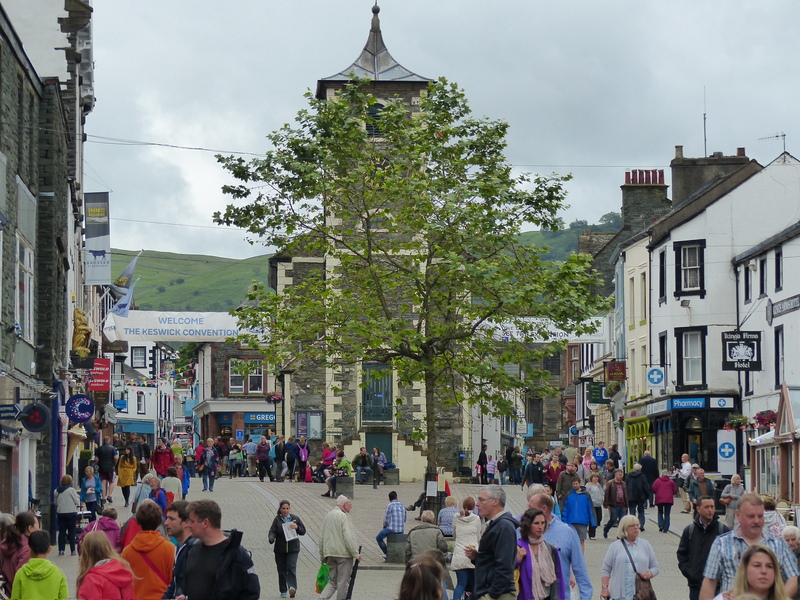 Our first stop was the town of Cockermouth and it was a lovely little town. It was like being back in the villages again, with the historic Georgian buildings, little alleyways and friendly people. 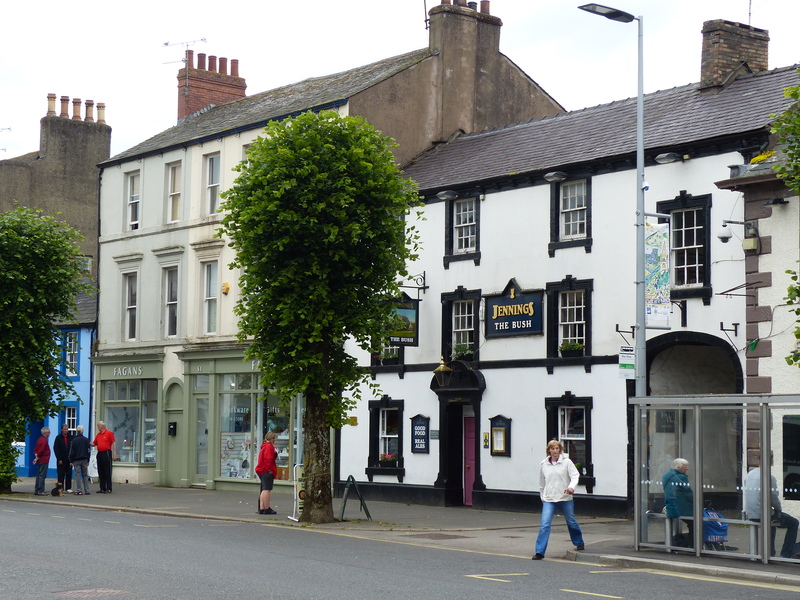 We strolled around the streets and discovered that Cockermouth is the birthplace of William Wordsworth and the house where he was born is still there in the main street. 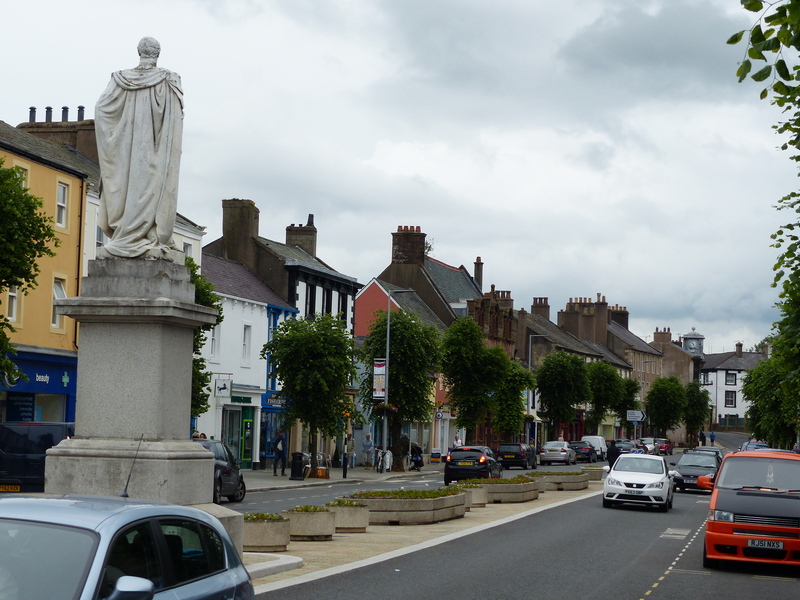 Cockermouth is also the birthplace of Fletcher Christian, he of the mutiny on the Bounty fame. 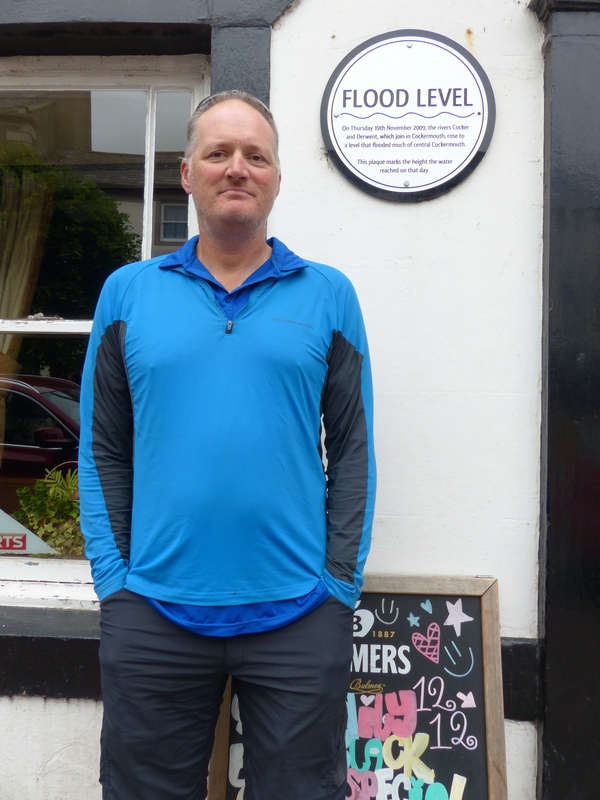 We read some placards describing the history of the town and learnt about the devastating floods of 2009, which had flood levels that would have left Steve unable to wade through them. As we were leaving we walked past a greengrocer, so I popped in to pick up some blueberries. While I was in there I listened to a conversation between the lady serving and a lady customer. It just sounded gorgeous, especially hearing that word “grand”! I handed her my blueberries and as I paid she said, “That’s loovly. Thank you very mooch. Loovly. Bye now.” When I left I just grinned! In fact I walked up the street with a big grin on my face because it was another “love it” moment. The friendly people, the gorgeous village style conversations. I felt like I was back where I belong! Walking back from the greengrocer. I couldn’t stop grinning from experiencing another “love it” moment. As we drove on, the scenery was nothing short of breathtaking. I exclaimed, “Wow!” many times. 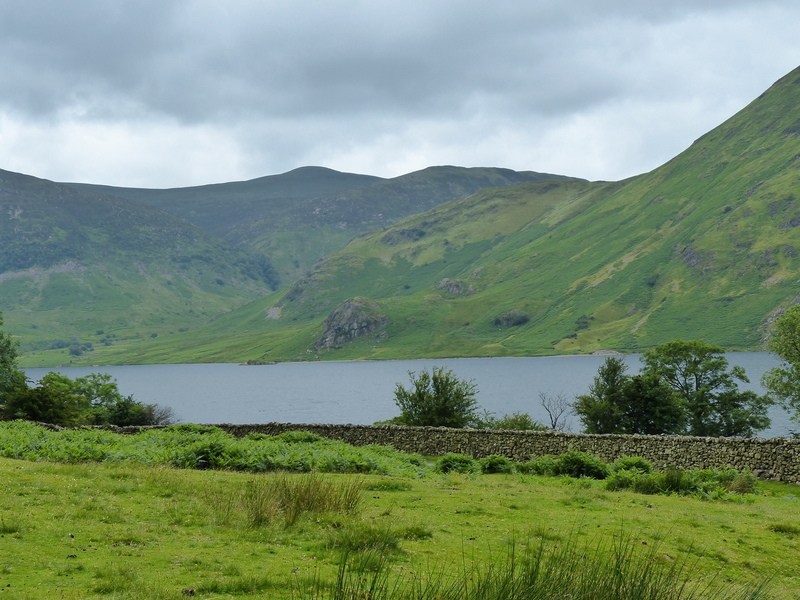 The huge hills, rising high above the lakes, the endless stone walls and free roaming sheep, it was simply magic. 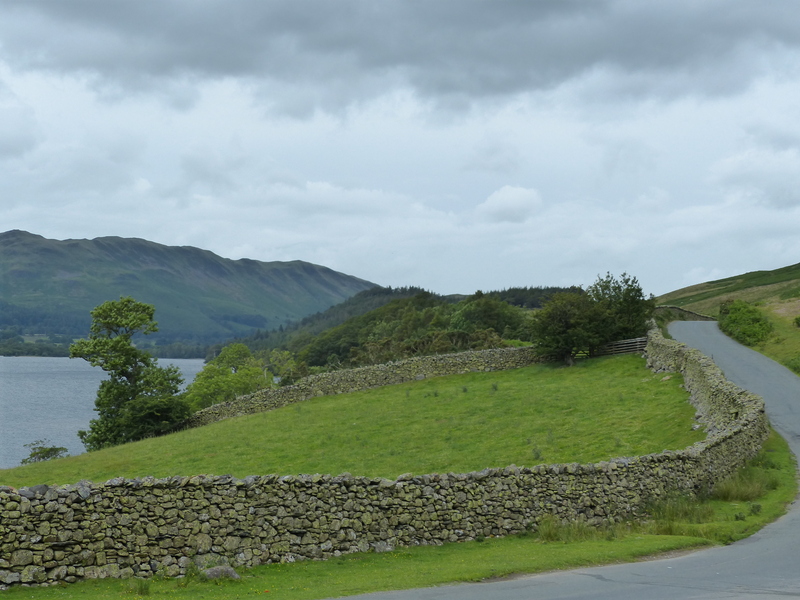 One thing that amazed me was the stone walls that not only lined the roads and ran through the paddocks but went up, up, up those enormous hills! Imagine having to climb those hills and build those walls on those slopes and imagine having to carry all those stones and slate up there in order to build it! Incredible! The stone walls just kept going up the hills, many were a lot steeper than this and still the walls went on! Steve did a brilliant job of navigating the very narrow and winding roads, with stone walls on each side, carefully avoiding scraping the van and making way for oncoming cars. It was a tricky task. 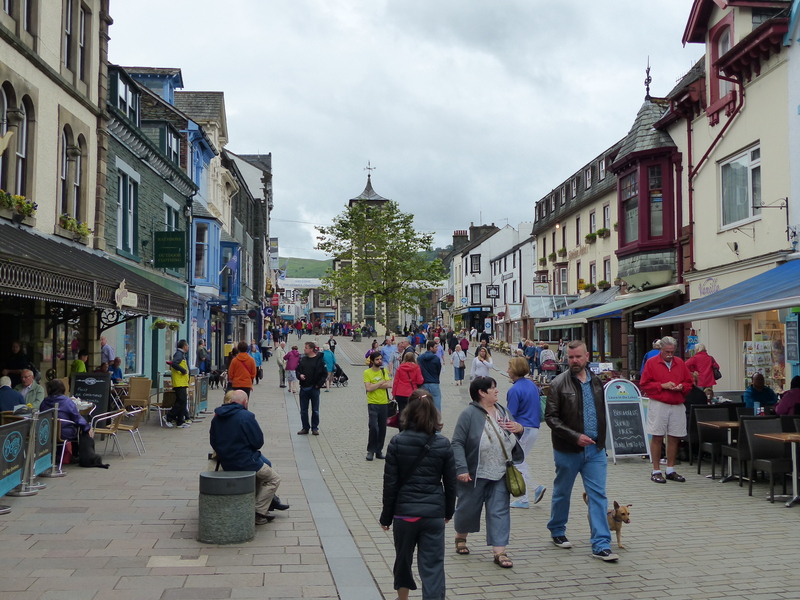 We stopped in the town of Keswick, which was another really nice town, although it was really really busy and seemed to be full of ramblers in their jackets and walking boots. 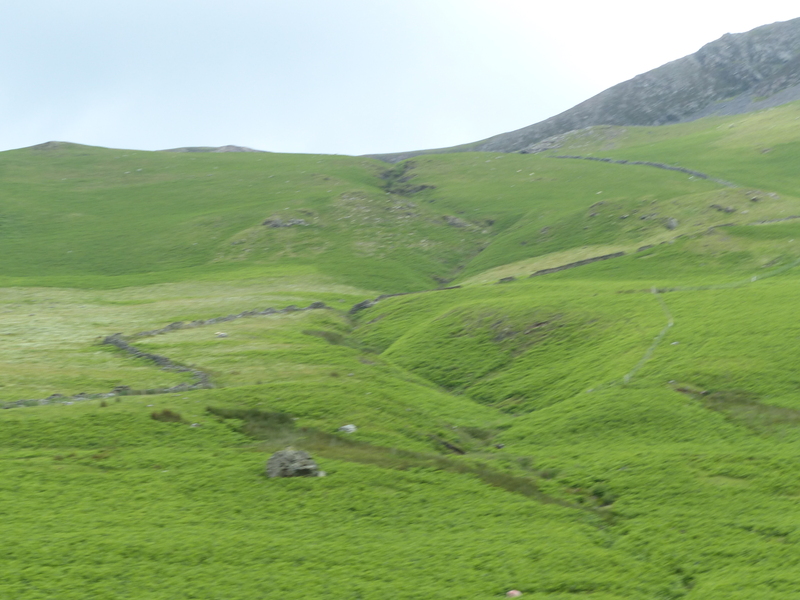 The Lakes District is known as a walkers’ and hikers’ mecca and they were certainly out in force. By this time, it was now raining and quite chilly. We actually started the day first thing this morning, in t-shirts and by 11:00 we were in fleeces and puffer jackets and rain coats! 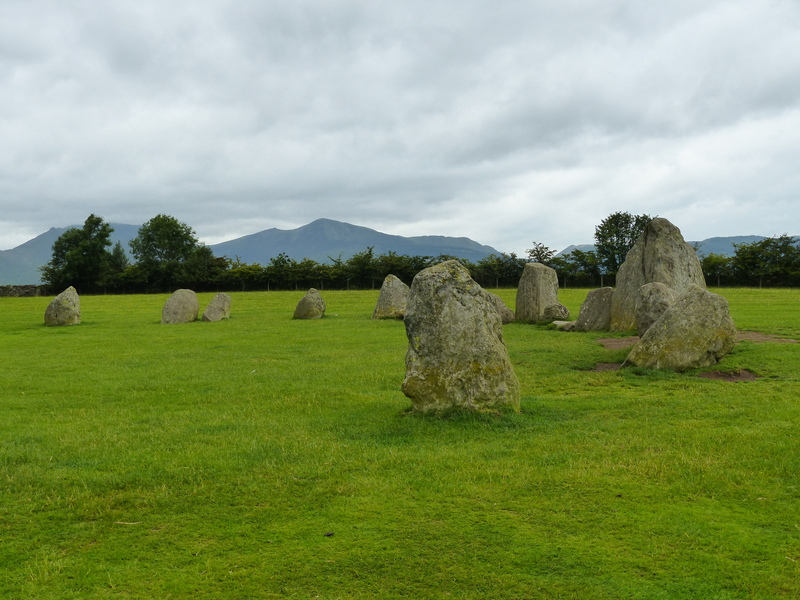 As we left Keswick, we stopped a short way out of town to walk up a field in the rain and have a look at the Castlerigg Stone Circle. 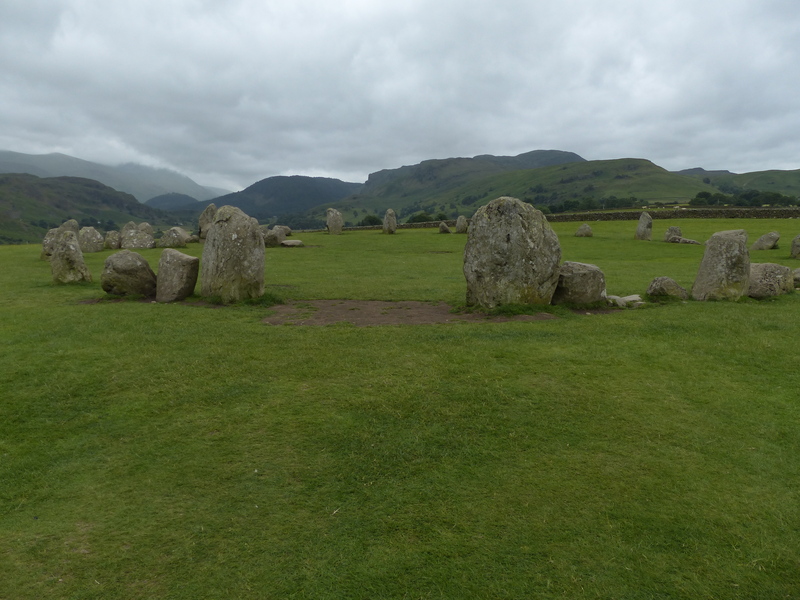 It was built about 4500 years ago and was used for ceremonies. I guess it was something like a mini version of Stonehenge. 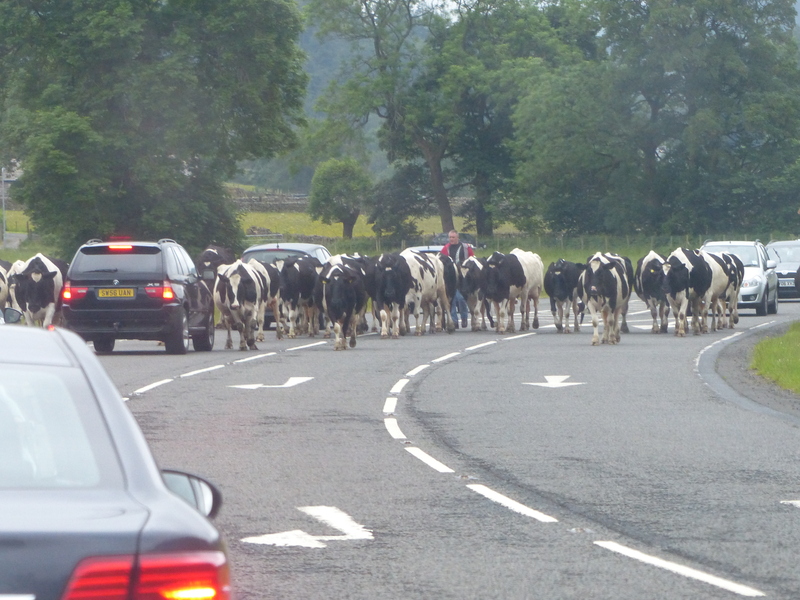 As we drove along, we saw another perfect country image – cows being herded down the main road. We have cows crossing roads at home, but they just nip across the road that’s a very quiet country lane, but these were happily strolling right down the middle of the busy main road. Stop! Cows strolling! Cows have priority! It looked terrific. 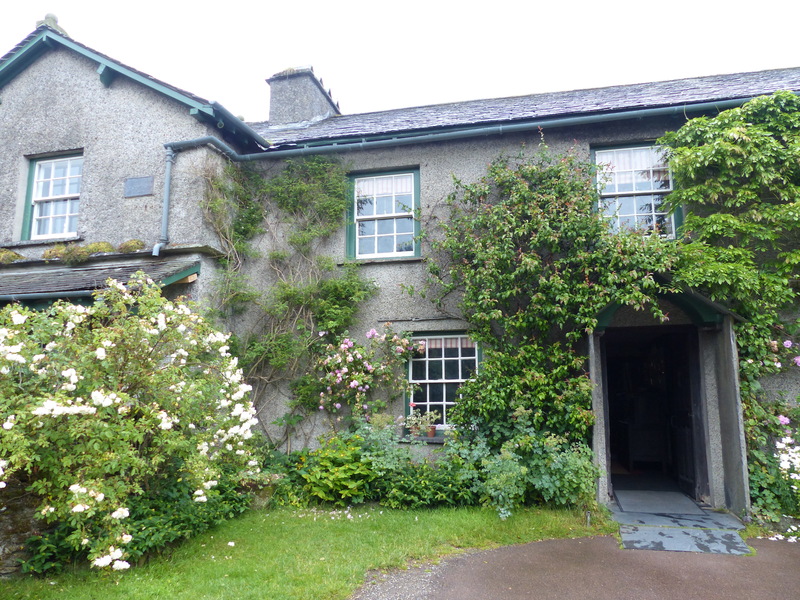 There was a place that I really wanted to visit – Hill Top, the home of Beatrix Potter. 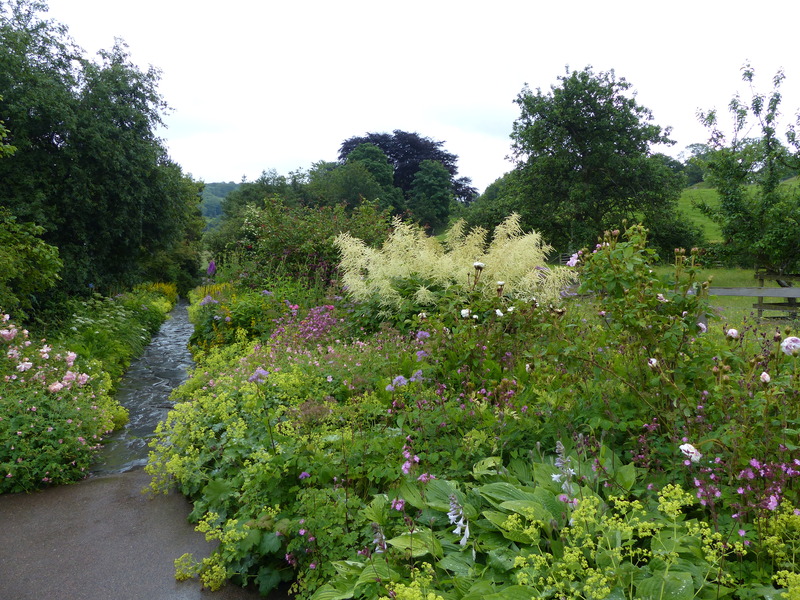 We continued on along the narrow, winding, hilly roads, marvelling at the spectacular scenery and arrived in the village of Hawkshead and then up the hill to Hill Top. 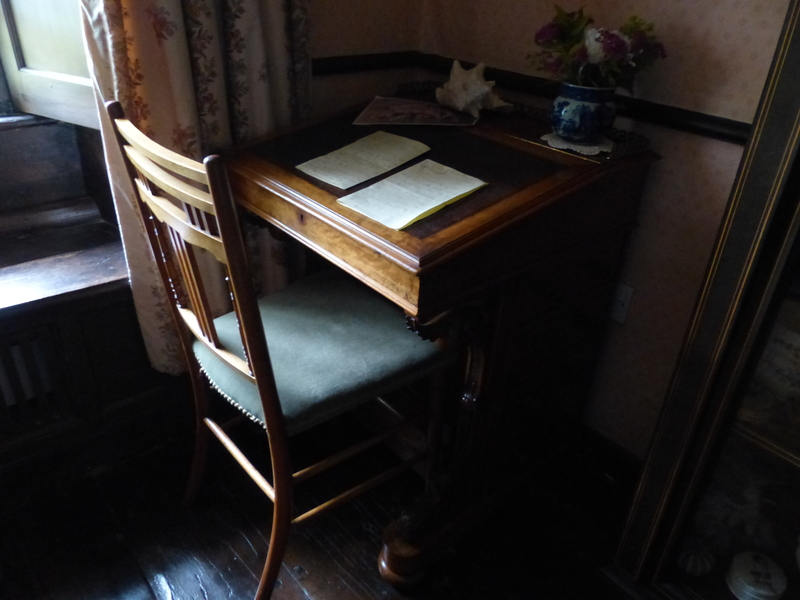 The house is almost as Beatrix Potter left it, completely original and everything inside had been owned by her. What was really special, was seeing so many things that she had included in her illustrations. We walked up the path towards the house and it was the same view as the illustration from The Tale of Tom Kitten, we looked out an upstairs window to see the lane snaking up the hill beyond the roof tops and chimneys and it looked completely unchanged from the illustration in The Tale of Samuel Whiskers. 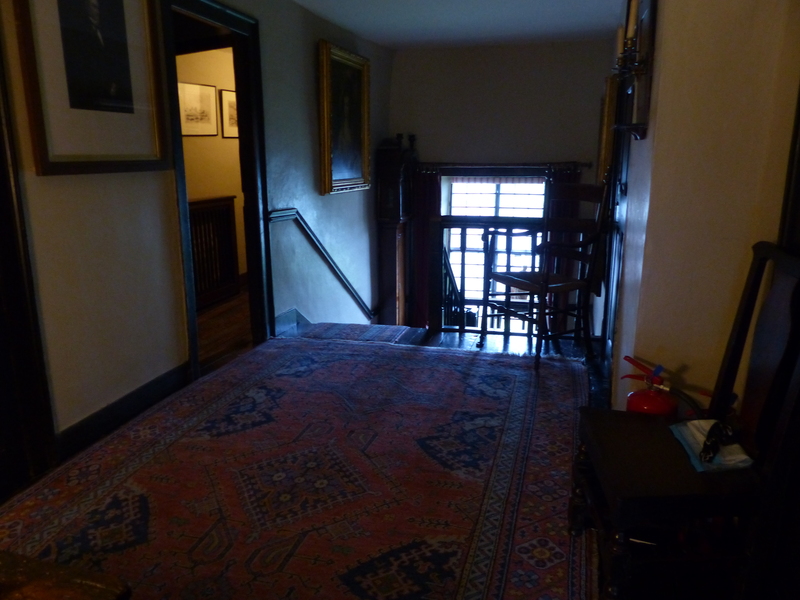 Even the landing at the top of the stairs was exactly the same as the picture of Samuel Whiskers with his rolling pin on that same spot on the top of the stairs on the exact same rugs. 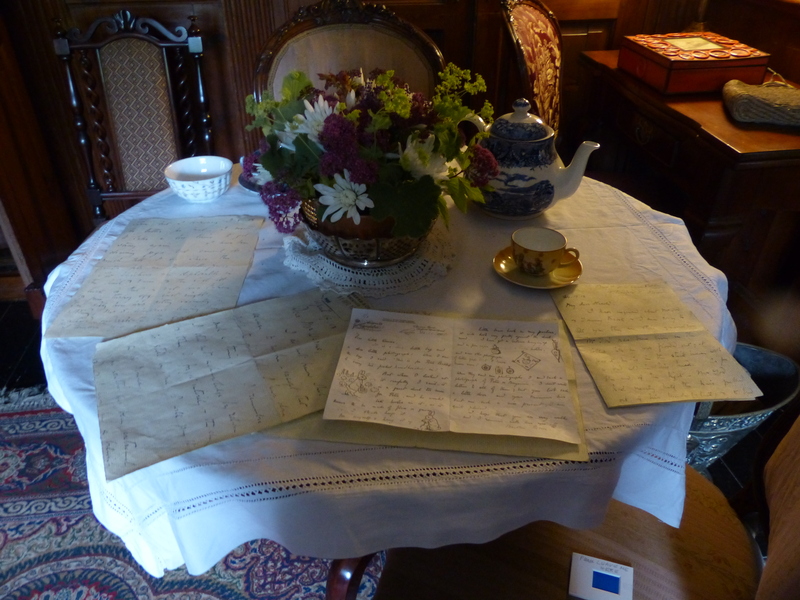 Beatrix Potter used so many things from her own home, garden and the surrounding village in her stories and illustrations and it was just wonderful to see all the things that inspired those favourite stories and gorgeous pictures. 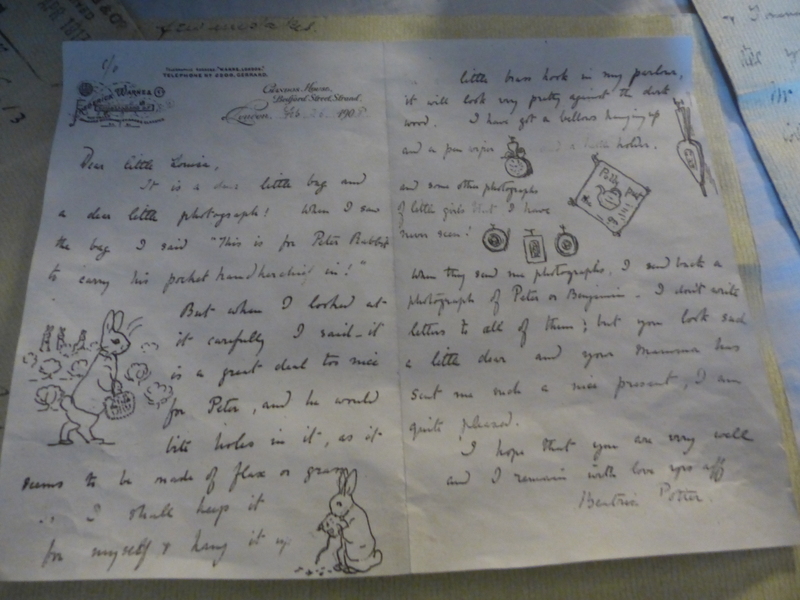 These letters were original, as if Beatrix Potter had just left them there. Any sign of Mr McGregor? 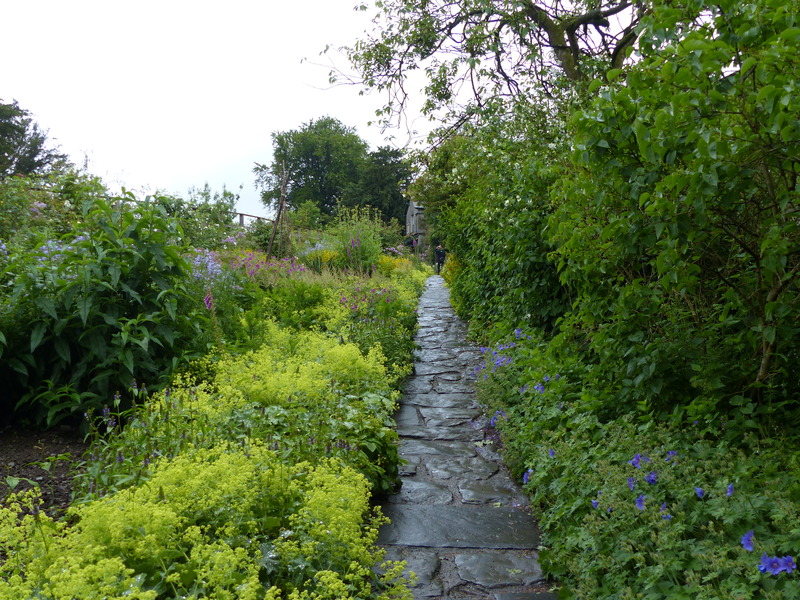 As we left Hill Top, it was now absolutely pouring with rain, bucketing down. “Too wet to camp,” declared Steve. Too true, it would be nice to be somewhere dry. 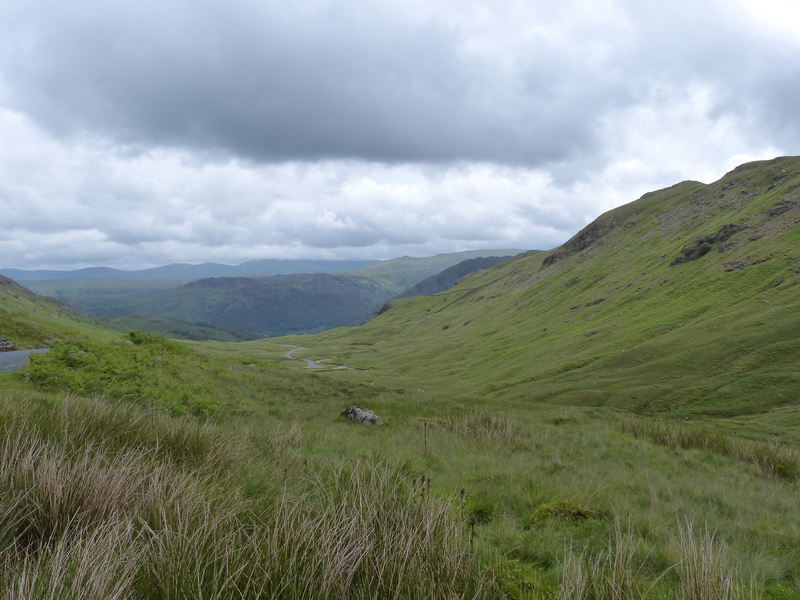 We couldn’t get any phone reception so just continued driving until we eventually picked up a signal, did some quick online research and found a hotel in Windermere, so set off there for a warm and dry spot to stay for the night. So here we are, in a nice little hotel in a nice little town and we have a view of Lake Windermere which is very big and very grand. 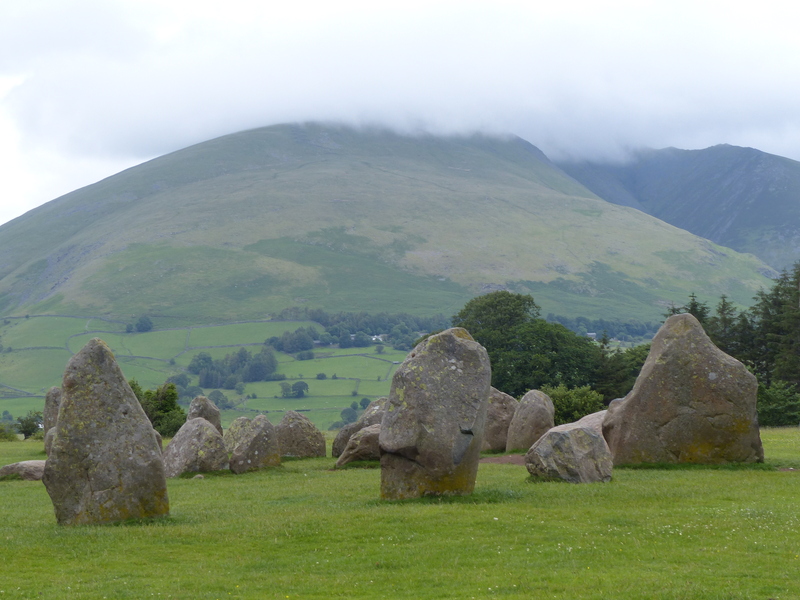 Tomorrow we’ll continue on through the Lakes District and then begin heading east. I loved what we saw today. I have to say, the scenery and hills and lakes even trumped the Scottish highlands for their majesty and take-your-breath-away beauty. 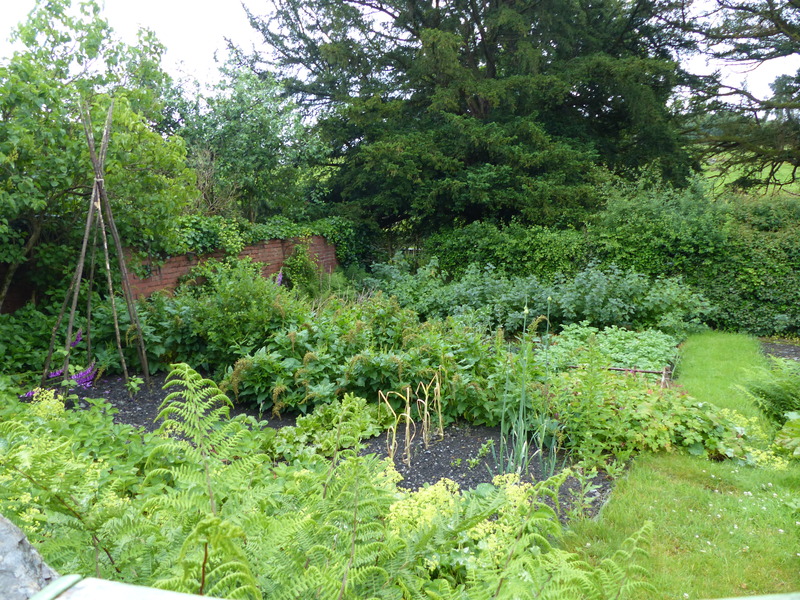 The weather was chilly and damp, but failed to dampen the experience. 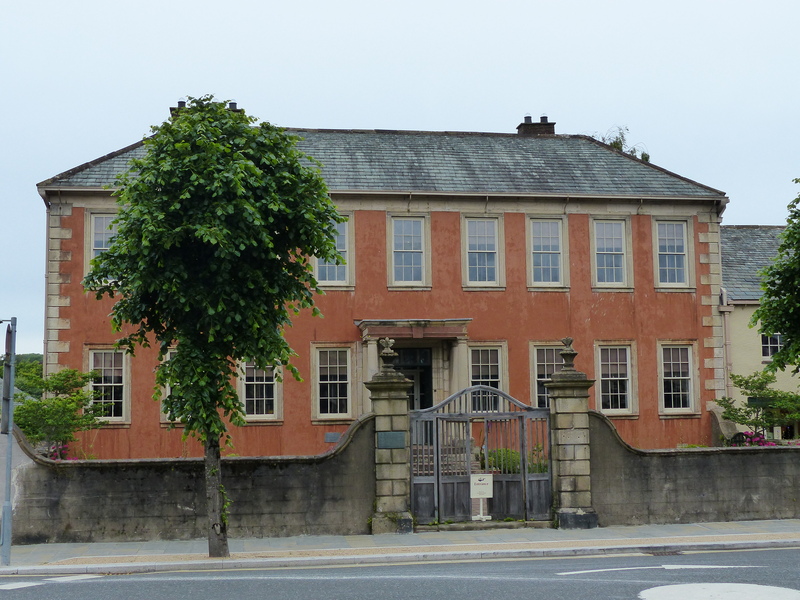 Wherever this county is experiencing a heat wave at the moment, it hasn’t found its way to us! Not to worry, it’s days like today, with the wind and rain and cold that make me feel less guilty about being in a van. Not to mention the sizeable hills we climbed today that would have taken multiple breathers to get up on a bike. The only thing that was difficult with the van was how hard it was to take photos. The roads were too narrow to stop, so many of them had to be snapped out of the window of the moving vehicle. At least on a bike we can stop pretty well anywhere to snap a shot. It was a great day. 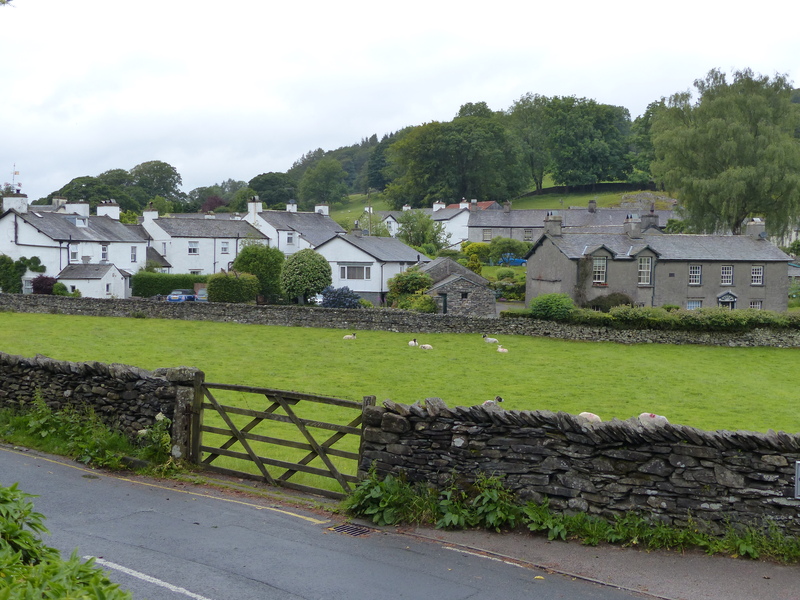 Seeing the scenery, gorgeous towns and villages and visiting Beatrix Potter’s house. England has returned to form by giving us gems of experiences and sensational scenery. Just when I thought the treasure chest was full, from all the gems and golden moments we’ve collected, we just seem to collect more. That treasure chest is now overflowing! I hope it continues, it seems bottomless and I’m determined to just keep filling it up! Oh England, My Lionheart…We’re Back!